In the early days STT Jaffray was known by the name The Makassar Bible School, founded by Dr. Robert Alexander Jaffray (a Canadian) in the year 1932. He was a missionary with the Christian and Missionary Alliance (C&MA), founded by Dr. A. B. Simpson, a Presbyterian pastor who later adopted an enthusiasm for evangelism and holiness. Earlier Dr. Jaffray had spent 32 years serving in the Guang Xi Province in China. The ministry in China spread to even as far as Indo China (Vietnam). Later his heart was burdened for the ministry in southeast Asia after receiving a vision about the need there. He went to the colonial area called the Dutch Indies (now Indonesia). Dr. Jaffray first stepped ashore in Samarinda, East Kalimantan on February 10, 1928, and from then on he began making plans to open the ministry in Indonesia. In 1932, assisted by former students from China, the mission was named China Foreign Mission Union (CFMU) and Rev. 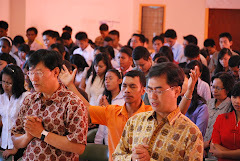 Dr. Leland Wang was the leader of the opening of the Makassar Bible School. Its purpose was to help prepare national workers to develop the ministry in Indonesia, mostly in Kalimantan, Sulawesi, Papua, Bali, and Timor. Dr. Jaffray also founded the publishing house, Kalam Hidup (Living Water) in Makassar, which was involved in publications, a magazine, and a radio station (today the main office of Kalam Hidup is in Bandung). In 1959, Makassar Bible School changed its name to Jaffray Bible College to honor its founder. The level of acceptance for students also changed, accepting only students out of high school rather than students out of middle school as before. And in 1975, STTJ was listed in the Kopertis IX Sulawesi (Government Control Body for Higher Education) and received only those students who finished their high school diploma. Today STTJ is situated in the heart of the city of Makassar on a property that is 10.141 square meters, and has 460 students (Bachelor level and Master level) from various church denominations in Indonesia, particularly East Indonesia. The school is under the direction of the Gereja Kemah Injil Indonesia (GKII) a member of PGI (Ecumenical Churches Fellowship) and PGLII (Evangelical Churches Fellowship), however, the school has an interdenominational character. Today there are around 40 church denominations represented among the student body. Besides the GKII, STT Jaffray is also supported by means of societies or donations from churches under the auspices of former CFMU members, specifically Gereja Kebangunan Kalam Allah, Sinode Gereja Kristus Yesus (GKY), Gereja Hok Im Tong Bandung, and other societies as well. STT Jaffray has been accredited by the National Accreditation Board of the Kementrian Pendidikan Nasional of Indonesia (Ministry of National Education) and is under the auspices of Kopertis IX Sulawesi and also the Ministry of Religion in Indonesia. STT Jaffray has also received permission for the organization of its postgraduate program and is accredited by Ministry of Religion in Indonesia. The mission of STT Jaffray is a worldwide mission, that is, to reach the world for Christ. Today alumni from STT Jaffray are scattered in various places in Indonesia and Malaysia. We also emphasize missional ministry to areas in east Indonesia which have received less attention. An emphasis in our education is how we can shape leaders and ministers, who are upright, spiritual, rooted in the Word of God, and have a heart for missions to those who have yet to hear the gospel with a holistic ministry to the society. My wife is Indonesian and graduated from this school,We are both fiull time Ministers(I am from America enjoyed reading the History of the School.